October marks National Vegetarian Awareness Month. Many people choose to follow vegetarian diets to improve their health and manage their waistline. Others opt for meatless meals for ethical or environmental reasons, as producing meat requires 100 times more water than plant proteins, not to mention, more land and energy. However, you do not need to be 100% vegetarian or vegan to see these positive outcomes. Simply reengineering your diet to be more plant-forward and reducing overall meat consumption can help you be kinder to your body and the earth! Looking for something different? Hoya Hospitality offers a variety of vegan or vegetarian options at each location to assist you with meatless meals in a pinch. 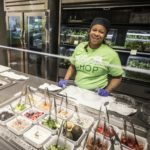 Be sure to check out Hoya Eats full menu and other sustainability efforts here.